-----Most rivers begin with a trickle. Maybe from a spring or a swamp. Not the Ohio. This great river begins as an adult, from the merging of two other adult rivers into one behemoth. 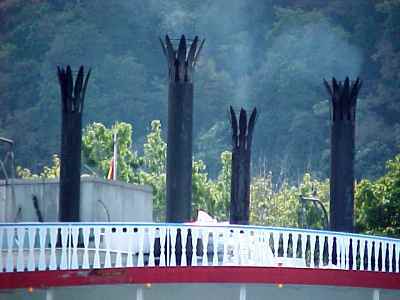 The Allegheny River, navigable for over sixty miles by barges, and the Monongahela River, itself navigable for over 125 miles, join at The Point in Pittsburgh to create the Ohio River. 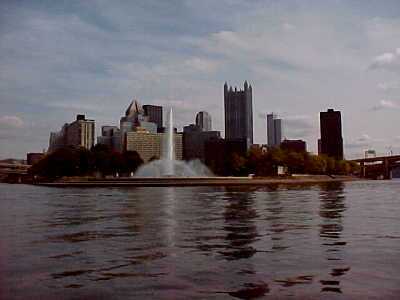 -----A few minutes after leaving the dock, we were in Pittsburgh. As we rounded The Point, where the Allegheny and Monongahela's waters merge to form the Ohio, Halcyon was reenacting history. We were at the site vital to the expansion of America's Northwest Frontier. Here, not only two great rivers met, but also the two most powerful European cultures. The rivers merged; the cultures were in conflict. Caught between the British and French, Native Americans were fighting to preserve their culture and the lands they knew. -----The French required control of the Ohio River to link French Canada with French Louisiana. The British needed to break that link in order to expand their colonies to the west of the Appalachians. Native Americans allied with the French against British territorial expansion. The key to control lay at The Forks of the Ohio. The nation that held The Forks controlled the destiny of the continent. Whether Americans were destined to speak French or English was in the balance. -----Britain claimed the territory, and in 1681 granted Pennsylvania to William Penn. The French, however, were on the site. Rene-Robert Cavelier, Sieur de la Salle, was the first European to see the river. It is thought he descended the Ohio as far as Louisville in 1669, but his documentation is incomplete. In 1682, he descended the Mississippi River and noted the junction with the Ohio. He claimed the main stem of the Mississippi River and all her tributaries for France. -----From 1690 to 1754, the French and British were engaged in a succession of European wars, mostly prompted by the vanities of kings: King William's War, Queen Anne's War, and King George's War. There was little consequence in the American colonies, until 1754, when the fourth war ignited on this continent. This was the Seven Year's War, or, as we know it here, the French and Indian War. -----Political chicanery is not new to our nation. In 1752, Virginia Governor Robert Dinwiddie granted a half million acres of land along both sides of the Ohio River to the newly formed Ohio Company. Of course, he was a stockholder in the company (as were several of George Washington's older brothers). To compound matters, this wasn't his land - Indians had occupied it for millennia and the French claimed it. ----- When the French heard Gov. Dinwiddie's intent, they built a series of Forts along the Allegheny and Ohio Rivers. In April 1754, 500 French troops overwhelmed Colonial defenders at Fort Prince George, at The Forks, without firing a shot. They immediately built Fort Duquesne on the strategic spot. In late May 1754, Gov. Dinwiddie sent 23-year old Maj. George Washington, with 150 Colonial militia, to attack the fort. Sixty miles from The Forks, they had a brief skirmish with the French. Men on both sides fell. Washington quickly surrendered when he realized his force was badly outnumbered. These opening shots began a War that changed America's destiny. ---------The next year, a force of 1,500 British regulars, under General Edward Braddock, was sent to destroy Fort Duquesne. Maj. George Washington accompanied him. He advised Braddock, who had experience fighting in the European wars, where armies met as though on parade, that different tactics were necessary in the American wilderness. General Braddock ignored the advice. On the 9th of July, a bright summer day, the British army forded the Monongahela River, marching in rows, like little tin soldiers. They were resplendent in bright red uniforms with shiny buttons, drums rolling, colors flying. Eight hundred French and Indians lay in ambush behind trees and rocks. Within hours, the British were in pell-mell retreat, leaving 877 men killed or wounded. Field officers, riding high on horseback in shining uniform, were marked targets. Soon all the officers, except George Washington, were dead or wounded. Braddock was shot and fell from his horse, "…surrounded by the dead and abandoned by the living." His panicked troops raced past him. Finally, several of his officers carried him from the field. Several days later, he murmured to himself, "Who would have thought it," and died. -----My family has deep roots in these Pennsylvania hills. In 1738, John Jacob Boyer, my fifth great-grandfather, stepped off a boat in Philadelphia. His father, a German Rhineland farmer, and his three brothers accompanied him. One year after the first shots of the French and Indian War, in 1755, he and his family walked through the wilderness to Lehigh Gap. There, near Weider's Crossing, they helped build Fort Lehigh, a stockaded settler's refuge from Indians, and took a deed for a nearby homestead. He cleared land, built a cabin, and raised crops. -----Braddock's Defeat was a disaster for the British, and for my family. Every frontier homestead was under now under threat from Indian attack. Many horror stories relate to massacres on remote farms. John gathered his family into the stockade at Fort Lehigh for protection from marauding Indians. But crops had to be tended to survive on the frontier. One warm day in the summer of 1756, John took his thirteen-year-old son and his six- and four-year-old daughters to the farm, leaving his wife at the fort. While John plowed and his son hoed, the young sisters played near by. Suddenly and quietly, three Shawnee Indians came into view. John shouted for the girls to hide and called to his son to run, and he himself endeavored to reach their house for his arms. Finding that he could not do so, he ran toward a creek in a vain attempt to draw attention away from the children. He swam the stream but was shot through the head as he ascended the far side. The three children were soon found and captured. The Shawnee then scalped their dead father before their eyes, burned the homestead and carried away the children as captives. ----------Two years later, in 1758, 6,000 advancing British and Colonial soldiers marched toward The Forks. In the face of such a force, the French burned Fort Duquesne and withdrew. On the site of the charred remains, the British built Fort Pitt, named in honor of the Prime Minister of England. It became one of the major British strongholds in North America. -----French influence and control of the western frontier collapsed when the French and Indian War ended in 1763. Into the vacuum, stepped Pontiac, an Ottawa chief in the Detroit area. In May, he attacked Fort Detroit. Shortly after, Fort Sandusky fell, with all defenders massacred. Indians attacked British forts and settlements throughout the frontier, killing and capturing British settlers. The Indian rebellion, now called Pontiac's War, spread eastward. By July, 1763, nine British forts had fallen, a tenth fort was abandoned, and Indians seiged Ft. Pitt, at the Forks of the Ohio. -----This was the greatest Indian threat of the 18th century to the Colonies. New York, Pennsylvania, Maryland, Virginia, Ohio, Indiana, Michigan, and Wisconsin were affected. In the fall, The British command ordered a force of 400 British soldiers, under Col. Henry Bouquet, to relieve Ft. Pitt. The Indians ended their siege of the Fort and met the British force near Bushy Run. The British feigned retreat, and when the unsuspecting Indians followed, the British sprung the trap from hiding. They had learned well from the lesson of Braddock's defeat. By October, most of the Indians on the frontier had run out of ammunition and the rebellion was over. In November, all colonial captives were to be returned to Ft. Pitt and Col. Bouquet. -----J John Boyer's three children were among the captives. His son was released and returned to the farm. His oldest daughter had married an Indian and chose to remain with the Shawnee. John's youngest daughter, Margaret, my 4th great grandmother, was eleven years old. She also remained with the Indians. -----At the end of Pontiac's War, after the Indian defeat at Bushy Run, the threat from hostile Indians was reduced along the frontier. Treaties required Natives to move to the Ohio River country or beyond. Margaret Boyer traveled with her Shawnee and settled near a bend in the Ohio River. -----My fourth great-grandfather, Richard Conner, an Indian trader, was living on the Ohio frontier. There he met Margaret and they fell in love. He applied to the chief for permission to marry, and it was granted - but with two conditions. First there was money to be exchanged since the chief valued Margaret as a member of the tribe. The second was harder to meet than the first. Their first-born son was to be given to the tribe to be raised. Richard paid $200 in silver and they were married in 1769. 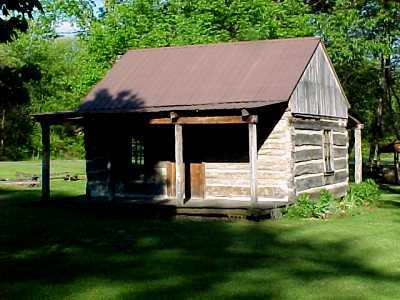 They built a cabin and lived with the Indians in Ohio. In 1771, their son James was born - the first child born of English parents in what is now Ohio. One year after the birth of James, the second condition was met - he was given to the Shawnee to be raised. -----During the Revolution, Pittsburgh was a garrison town on the frontier. After the war, Pittsburgh became the gateway city for the frontier and boomed. In 1787, the Northwest Ordinance opened Ohio Territory to settlers and a flood of settlers, many veterans given land for their service in the Continental Army, came down the rivers. To accommodate them, many boat builders set up business along the upper banks of the rivers. They built the boats for the Lewis and Clark Expedition. -----In 1782, John Yoder made a flatboat voyage down the Monongahela, the Ohio, and the Mississippi - all the way to New Orleans. The trip was a great commercial success, and shortly many flatboats were taking the six-month trip down the river. Some lucky boatmen returned to Baltimore by sea and walked over the mountains to their Pennsylvania homes. Others walked home along the Natchez Trace and other wilderness roads back to Pennsylvania - a 2,000-mile trek. -----About the turn of the century, keelboats were designed that could be propelled upstream with the use of long poles. They soon replaced flatboats, and travel moved both directions on the river. In 1819, there were about 500 keelboats between Pittsburgh and Cincinnati. The hardy and colorful river men who manned the keelboats were a rough and hardy breed. The King of the Keelboatmen, Mike Fink, boasted that he was "half alligator, half horse, suckled by a wildcat and the playmate of the snapping turtle." -----The first steamboat on the Ohio System, the New Orleans, was built on the Monongahela and she chugged all the way to New Orleans in 1823. ----- Industry and commerce exploded during the 19th Century. Steel furnaces fired cannons and balls for the War of 1812. 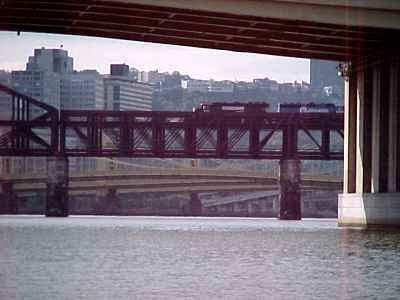 Andrew Carnegie built iron bridges after the Civil War and monopolized steel manufacturing from Pittsburgh. With the river highway and abundant coal and natural resources, the town grew into a major manufacturing city. -----I remember it as a child, my mother being a native of-the city, as a dirty, smoky, dark place. Frank Lloyd Wright is reported to have said, "Abandon the place, and rebuild anew." All that has changed. In 1947, smoke ordinances were imposed, a modern sewage system cleaned the river, and slums at the site of Ft. Pitt were cleared and replaced with a park. Today, handsome skyscrapers dominate the skyline and a beautiful city has emerged - a model of urban redevelopment.